Often it´s not easy finding a new outdoor-outfit every single day when the weather is cold outside and the only pieces you can wear are your 1-2 jackets. Isn´t it boring always looking the same on such cloudy days where your outfits are the only thing which can make the weather look more friendly? Believe it or not, but there is a very simple solution. – No, you don´t have to buy some more jackets. Just take all your scarfs and beanies out of your wardrobe and add some change to your outdoor-outfits. Did you noticed that this trench coat is the one I wore in my Inspector Gadget Article? :-) What I wanted to show you is, that some accessories can totally change your look. Even if you´re wearing the same piece of clothing! – In my case it´s the trench coat which I´ve re-combined. 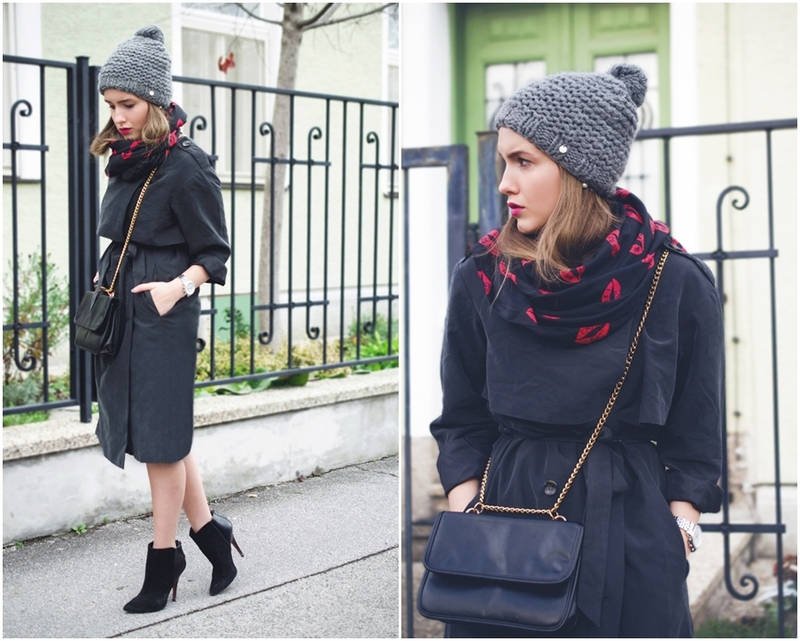 This time I simply closet my trench coat and wore it as a long vintage-dress, combined my trendy grey beanie and my wonderful scarf with it which added something modern to my vintage-look.